Coverage: Based at 62-64 Kimber Road, Wandsworth SW18, The German Motor Company operates throughout London and the wider Surrey area, specialising in the service and repair of German manufactured cars including BMW, Porsche, Audi, Mercedes, Volkswagen and Mini. 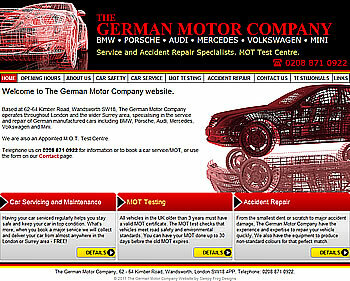 Specification: The German Motor Company had an existing website which was extremely outdated and difficult to navigate. They required a new website that was clean and easy to navigate, to coincide with the opening of their new premises in Wandsworth. "We are very pleased with the finished site. The final design shows exactly who we are, where we are and what we do! Its easy to manouvre around and our contact details are clearly visable on all pages. Carol had some good ideas and was always available to answer any questions or tweak anything that wasn't quite right. A very professional approach and excellent service all round."